Worcester, UK. Wednesday 2nd December 2015. Stanford Marsh Group, a leading independent solutions provider for the wide-format print sector which is currently celebrating its 50th year in business, has announced the appointment of Julian Mennell to the role of Business Development Manager for the Print for Profit sector. In this role, he will be responsible for helping UK and Ireland-based print for profit reprographics businesses invest in new technology more efficiently. With more than 20 years' experience in the printing industry - working with the likes of Colourgen, Xerox, Océ and more - and with the wide range of leading solutions from Stanford Marsh at his disposal, Julian is ideally positioned to offer unbiased advice to customers looking to upgrade their print technology. Additionally, he will be focusing on working with customers looking to upgrade to HP's ever-expanding PageWide XL Technology. With a compact footprint, HP PageWide Technology offers high quality at high printing speeds. It is scalable to meet a wide range of application and performance requirements and provides low cost of operation in both monochrome and colour. 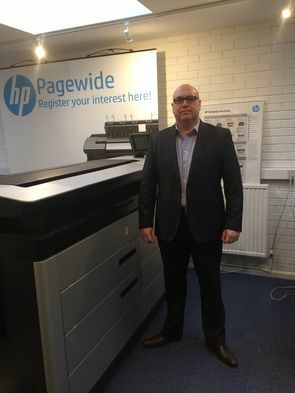 On his appointment, Julian Mennell explains: "By sharing my in-depth understanding of the latest print technologies, I can help companies utilise their technology budgets more efficiently. I can advise how they can reduce costs, improve quality of output and maximise profits within an ever changing market. "Thanks to Stanford Marsh's broad portfolio of print solutions from the likes of Canon, HP, Mutoh and Stratasys to name but a few - we are able to recommend and supply customers with print solutions that exactly meet their requirements."